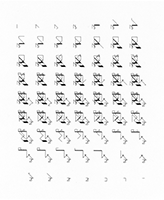 I used the lines of squares, triangles, and cubes as an alphabet in a number of different ways. 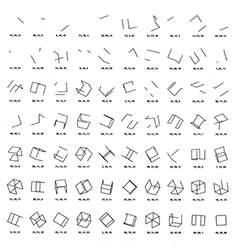 works from Cubic Limit I & II where I used the 12 lines of the cube as an alphabet. Adding and subtracting lines to create a structure. 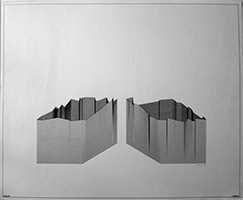 In Cubic Limit I many of the algorithms add and subtract lines of a fixed structure, the cube. 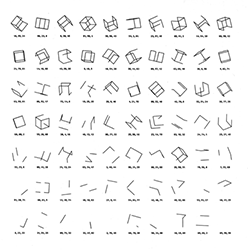 Early cube drawings. 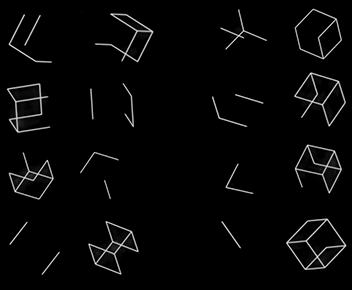 Random points along 4 sides of a cube are linearly transformed to their respective base straight lines. 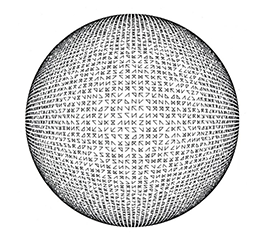 The 12 edges of the cube are used as an alphabet. 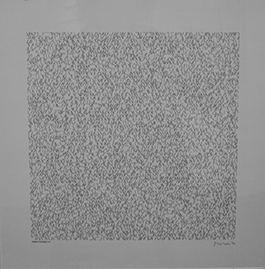 The two drawings have a complimentary number of lines for each cube. 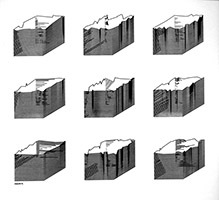 This is a study for the experimental computer generated films "Cubic Limit" and "Complimentary Cubes". 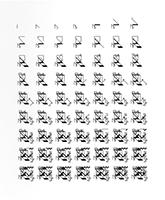 P-154 is published in the catalog: "Manfred Mohr, "Cubic Limit", Galerie Weiller, Paris, 1975"
Some images from film "Cubic Limit" showing lines n at a time, 1973-1974. Some sequences of this film were created in 1973. 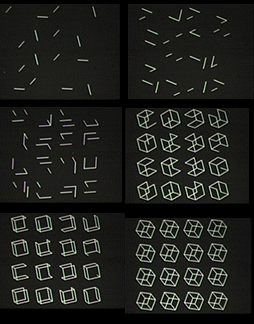 Some images from film "Complimentary Cubes" showing 2 cubes, one with n lines, the other its complimentary cube with 12 - n lines, 1973-1974. Some sequences of this film were created in 1973. 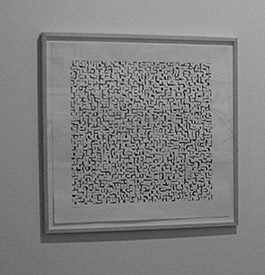 Images from these films are published in the catalog: "Manfred Mohr, "Cubic Limit", Galerie Weiller, Paris, 1975"
These works are published in the catalog: "Manfred Mohr, "Cubic Limit", Galerie Weiller, Paris, 1975"
In the meantime, these works can be seen on this website here.